The 40th Annual Air Race Classic buzzed the U.S. from June 21-24 on a demanding 2,716-mile route involving 13 airports from Prescott Municipal Airport (KPRC) in Arizona, to Daytona Beach International Airport (KDAB) in Florida. 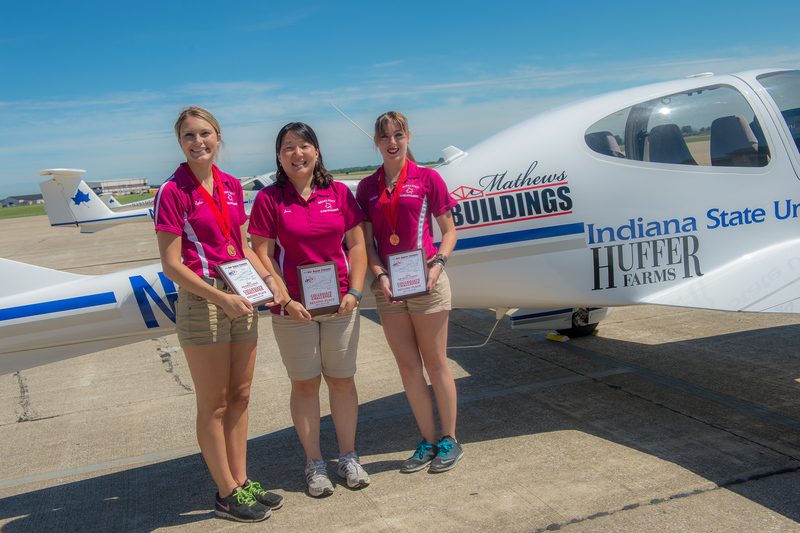 Indiana State University students Lydia Kost of Terre Haute, Kayleigh Bordner of Bringhurst, Ind., and MiJin Kim of Terre Haute made up Team Classic 5 "Flying Sycamores" and placed second, earning $3,000 and Bose A20 headsets for each member of the team. The race was the first Air Race Classic for Kost and Kim. "I participate in the Air Race Classic to pay tribute to the women who paved the way for younger pilots like myself," Bordner said. This year, the annual all-women cross-country airplane race paid tribute to college and university teams, with race stops at airports near or affiliated with aviation programs. Of the 55 teams registered for the race, five did not start, five did not finish, 45 completed the route, two teams arrived with parts they didn't begin with, and two teams arrived in Daytona without their aircraft. Team Classic 33 experienced mechanical problems. Leaving their Cessna Skylane 182Q at Lake City Airport, they arrived by rental car. Team Classic 38 suffered a forced landing in a field near Humansville, Mo. They were brought to Daytona by friends in another aircraft. Aside from having to turn in equipment, the ladies came to Daytona to celebrate with the other racers. Among the diverse women competing in the Air Race Classic were experienced racers, flight instructors, a Pulitzer Prize winner, three teams of families, a nurse, school teachers, retirees, ATPs, A&Ps and 19 collegiate teams. With team names like Sure B.E.T., Sky Vixens, Half-Fast Slowdowners, Freakin Awesome, Above All Fly Girls, Team Wunder Woman, Fire & Ice, American Maids, Wildfire, Cool Beans and COMM Cool & Connected, these racers show attitude. Lots and lots of attitude. At this year's race, 46 of the racers were first-timers. Also called "baby birds," the first-time racers are assigned mother bird veterans to go to for advice. Arlene Wohlgemuth of Classic Team 3, who raced for the eighth time this year, recalls that "on our first race, we accidentally left our charts at an airport about halfway through the race. Our Mother Birds brought them on the Terminus, but instead of simply returning them, the charts were ‘auctioned' back to us." The race is handicapped to equalize the variety of aircraft competing. Each team must carry two pieces of equipment owned by the ARC organization. A Bad Elf GPS is used to mark times for each leg of the race. A Spot GPS tracks the location of each team-by-team number. The Spot GPS tracker allows for live online tracking through an app and the through the AirRaceClassic.org website. Lydia Kost, Kayleigh Bordner and MiJin Kim of Team Classic 5 "Flying Sycamores" earned $3,000 and Bose A20 headsets.